Websites go down, and books go out of print, which happened with my first two books. But I was fortunate to be able to resurrect them in Ready for Dessert, a compilation of recipes from those first two books, as well as additional recipes that have become my favorites over the years. It was fun to go back and revisit, and update, recipes. And I got to make a few changes; We have high-percentage, bean-to-bar chocolates, a variety of flours are more readily available than there were a decade ago, and even the most elusive ingredients can be found online, delivered within twenty-four hours. 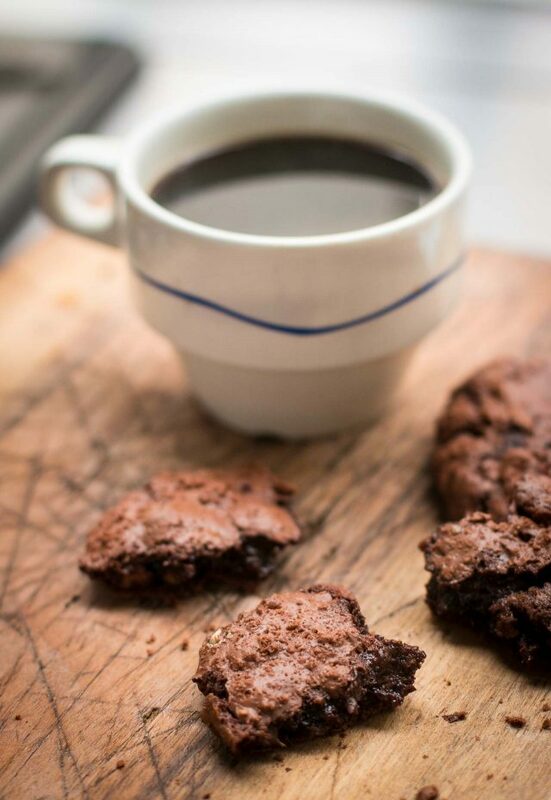 Fortunately these Chocolate Chocolate-Chip Cookies, which I featured in Ready for Dessert, can be made with ingredients you can find in any supermarket, something I always keep in mind when writing recipes. In spite of how easy it is to find things online, I like being able to make a batch of cookies whenever the mood strikes. And I seem to always be in the mood for these ultra-chocolate cookies, with crisp, brownie-like tops, and meltingly soft chocolate centers. Baking times for cookies are always tricky, and for these, it’s especially critical. Much depends on how cold the dough is, oven temperature, baking sheet material (I use restaurant-style baking sheets), and other factors, which merits an entire book, written by someone with a tremendous amount of patience. When baking these cookies, follow the visual clues more than sticking to a precise number of minutes. I’ve given both, but encourage you to use the baking time as a guide and to check them a few minutes before. You may want to bake one first, to find out exactly the right time for your oven. Once you’ve got it down, you’re good to go with the rest. 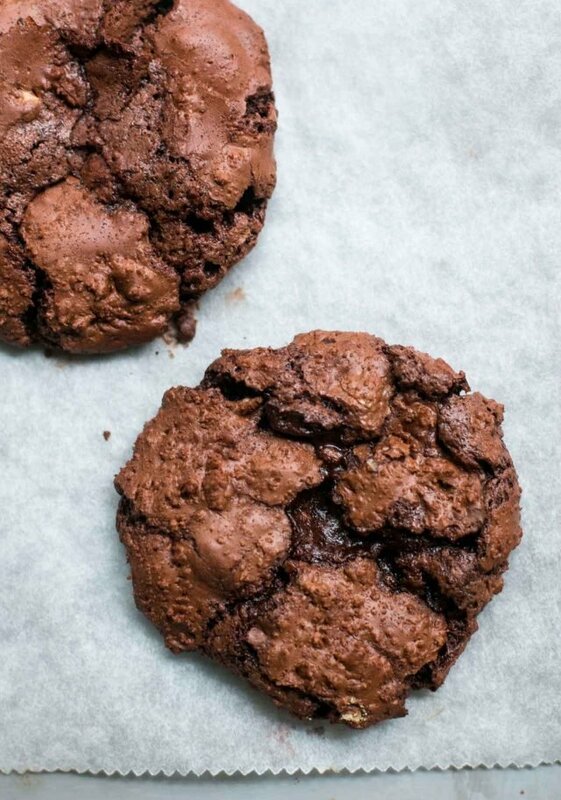 Adapted from Ready for DessertThese super chocolate cookies are packed with flavor. The trick is to bake them just enough so they're almost cooked through, but not quite.For those who are gluten-free, you can substitute 6 tablespoons (52g) of teff flour for the regular flour. The cookies may spread a bit more if using something other than wheat flour. If you try another flour, I might go with the full 1/2 cup (70g) of something like buckwheat or gluten-free oat flour. If you try them with something else, feel free to let us know in the comments how they work out. 1. Melt the chocolate and butter in a large bowl set over a pan of barely simmering water. Stir occasionally, until the chocolate is smooth. Remove from heat and set aside. 2. In a small bowl, whisk together the flour, baking powder and salt. 4. Preheat the oven to 350ºF (180ºC). Line two baking sheets with parchment paper or silicone baking mats. 6. Bake the cookies, rotating the baking sheets midway during baking, until they feel just slightly firm in the center and begin to lose their shine in the crevices, about 10 to 12 minutes. Remove the cookies from the oven and let cool. Looks yummy. 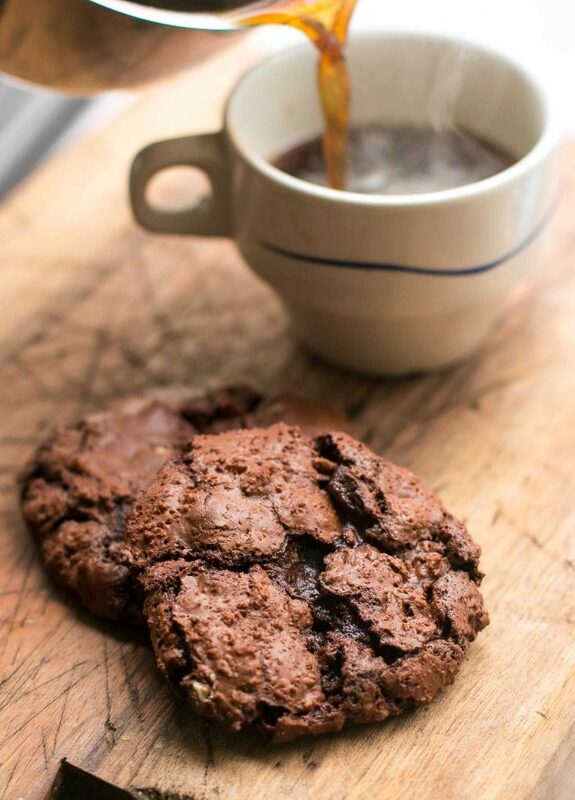 A chocolatey chocolate cookie recipe is always welcome. Your phots make them look irresistable. Thanks for sharing your recipe! Your photo looks amazing and I’d love to try… however I can’t take dairy. Would you know if I can simply replace the butter with oil? I’ve replaced it for other recipes before but never in this part of the recipe (melting butter with chocolate). Happy that I have all your books David!! What are the next two about?? I love the idea of baking cookies whenever I want them! Sadly, I do not need another vice in my life…but baking cookies whenever I want them seems worth it. Dear David: Would these be possible with the omission of nuts? Would adjustments be necessary? I don’t mean to ask you to alter your wonderful recipe, but if I make these and my husband can’t eat them, I will be in BIG BIG TROUBLE! Thank you! Thanks David for saying the number scoop you used Too often that sort of thing is left out. And to the perosn who felt you have too many directions He is wrong When all the proper directions are included error is lessened. Hi David! These look amazing… but I don’t own a mixer. Will a whisk and some serious elbow grease work? All I can say is chocoholic yum! How in God’s name are you not as chubby as I am becoming with the daily intake of delicious baked goods you claim to eat? These look divine!! Thanks for your generosity. If you click the little printer icon to the upper right hand corner where the actual recipe begins, you will get only 1 page of directions. Maybe it’s just me, but I find both brownies and Choc Chip cookies change texture drastically by the next day. It must be the richness from all the butter that does it. The dough storage allows for fresh cookies for at least for 5 days. Thank you for that! If one doesn’t have a mixer, can one use a whisk to mix together the ingredients? I haven’t got room for one in my kitchen and a little exercise never hurt! 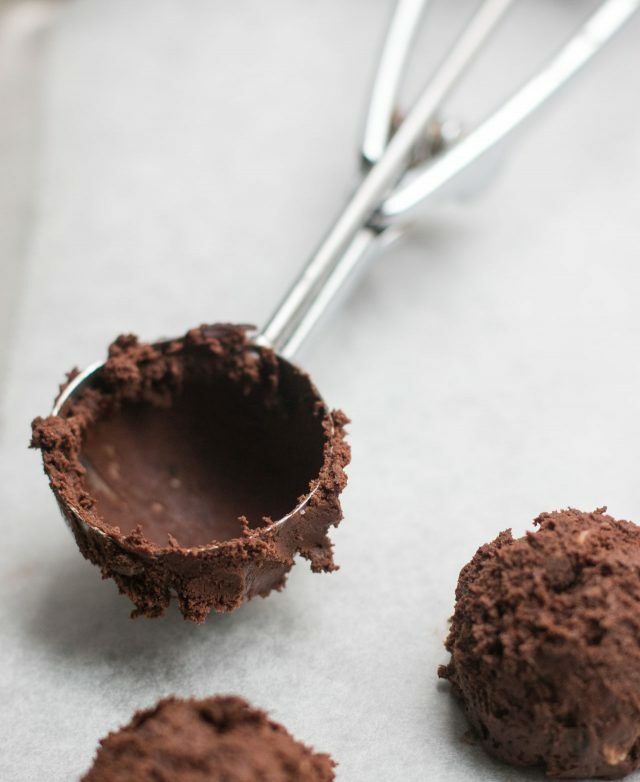 Yes, you can use a whisk…and a bit of energy! Did you play around with holding these in the fridge for while? Did you notice a change at all? Also if i was going to incorporate some Black chocolate powder would I fiddle with the flour or another ingredient? Can’t have toooo much chocolate. Can the flour be replaced with gluten free? Third line in the recipe. For those who are gluten-free, you can substitute 6 tablespoons (52g) of teff flour for the regular flour. I live at 8300 feet altitude, and wonder what I should do differently to make these outrageously good-looking cookies. Just to be curious, how does altitude change baking ? the cookies look delicious, but, let’s talk about the gorgeous mug. I’ve been a long time fan of these cookies since I purchased my copy of Ready for Dessert years ago. One variation I have loved is mixing in pieces of pretzels instead of (or in combination with) the nuts. Never thought of using pretzels in place of nuts but it’s a great idea. 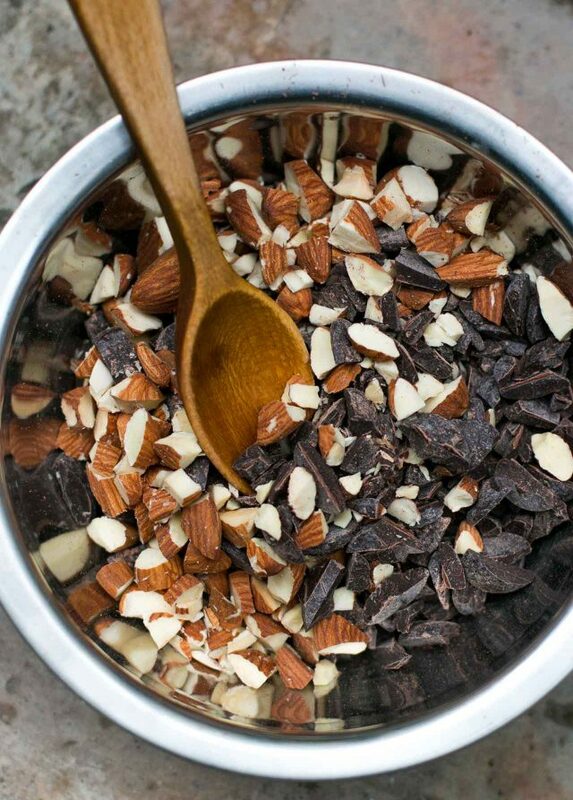 I often suggest pumpkin seeds or roasted cocoa nibs to add crunch. Glad you like these cookies, too! Thank you for providing a gluten free option with these cookies. I love your books and recipes and recently found out I have celiac. It’s still a big emotional and practical adjustment. Finding recipes that feel like old favorites makes a big difference. Thanks! 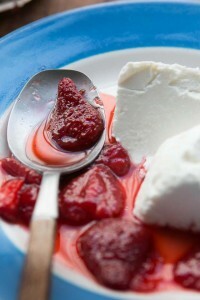 You are so generous with your recipes and I’ve always really appreciated it! Making these soon. I have all of your books…but these cookies? YUM! Drop the mike!!! For those who’ve asked about ingredient substitutions, I did a post that answers a lot of those questions: Baking Ingredients and Substitutions. odd curiosity.. most cookie recipes have you mix in the dry ingredients then add nut and chocochips.. why not the opposite(nuts, chocochips then dry). seems that trying to stir anything into a stiff floured dough would encourage gluten formation and toughen the cookie..
Wow, just made these and they taste even better than they look! The batter was much runnier than I was expecting, but after 20 minutes of chilling in the fridge it was perfect scooping consistency. Look at that gooey perfection on the inside. I wish I could grab one right out of my screen! David, I gleefully expressed my appreciation aloud when I read the directions to building the recipe. You did not, repeat – did not tell me to preheat my oven 1 hour before it needed to be! Thank you! 99.99% of all recipes I read have the directions out of order, i.e. preheat over, blend sugar and eggs, prepare dry ingredients, melt chocolate and let it cool, chill dough for 30 min. Thank you for doing it the right way so I don’t have to renumber the steps. The cookies look luscious! I really enjoy reading your stories of living in Paris. These look so good! Have you tried Hazelnuts in them? Love the photos and stories. You mention that these cookies can only keep for 1-2 days. Any chance to keep them longer? My cookies looked just like the picture when baked the first day, when baking the rest of the dough the second day they baked up shiny (instead of the dulling look above) plus they didn’t spread as much (and I did bring to room temperature before baking ) . Anyone else experience this ? Just wondering ..
You had me at a pound of chocolate! Hi David – I’m making these right now, and although I’m sure I’ve got all the measurements right, my batter is MUCH less stuff looking than the batter in your pictures – i.e., there’s no way the batter would “hold” in the ice cream scoop. Could you check to see if the flour measurement is correct? My dough was firm enough although it’s possible the temperature of my kitchen and/or the chocolate I used, was different. The flour amount is correct but if it’s too soft to scoop, chill the dough. I’ve added a note in the recipe about doing that if the dough isn’t firm enough. Mine was the same. Chilling the dough firms up the melted chocolate a bit and works fine. Took just 20 minutes for me. As ever, from David, a reliable recipe with really helpful notes that mean we understand what is happening and what we’re looking for – and become better bakers. Thanks David, these are going to go down a storm at work tomorrow. Side note – you’re so polite. I’ve even seen just “Recipe!” In the comments. I used a scale to measure out the flour (70gr) and the batter is too runny to hold it’s shape. Do I have to refrigerate before baking? FYI, in step 6 it says “. . . Remove the cookies from teh oven and let cool.” Which should be ‘the’. Cecile: Yes, I answered the question just prior to yours and added something to the instructions that if your batter/dough is too soft, it can be refrigerated. Alan: I don’t see that typo in my version. Perhaps refresh your browser? I loved these cookies. I’m making again today and using a very small scoop since I am taking to my craft group of 50-60 ladies. I want to make sure everyone tries them. Will definitely share these with people on my blog. 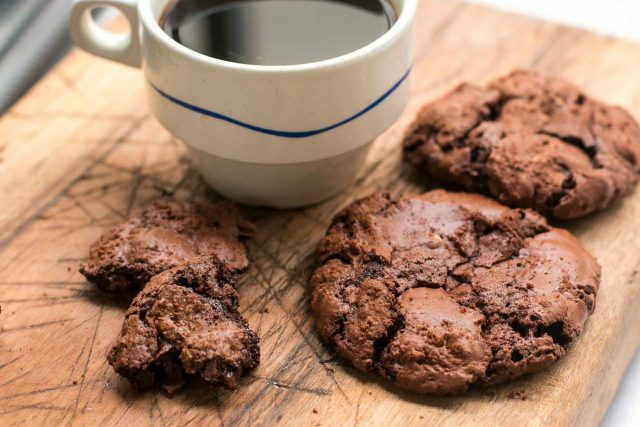 Have you tried adding any espresso powder to the cookie? 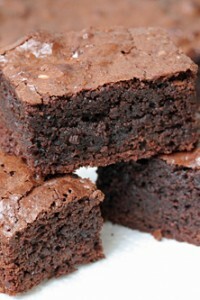 I used Thomas Keller’s Cup-4-Cup gluten free flour in this recipe and they came out perfect! Could not tell they were gluten free. Rachel: Thanks for letting us know and glad you liked the cookies! 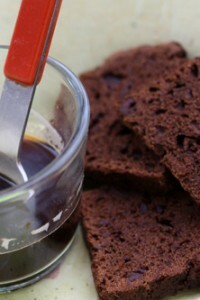 Sherry: Yes, I sometimes add 1/2-1 teaspoon instant espresso or coffee powder to chocolate dessert recipes. Yes, wholemeal flour would fall into the category of “another flour.” Some have used others, and left comments about their results. If you do try it with another flour, such as wholemeal, feel free to report back on your results here. I used walnuts and 1/2 cup of oat flour due to a wheat allergy. They turned out beautifully. Thank you for this delicious recipe. I made them and they were delicious! A big hit with my family. What brand of chocolate are you using here? Guittard? Cacao Barry? 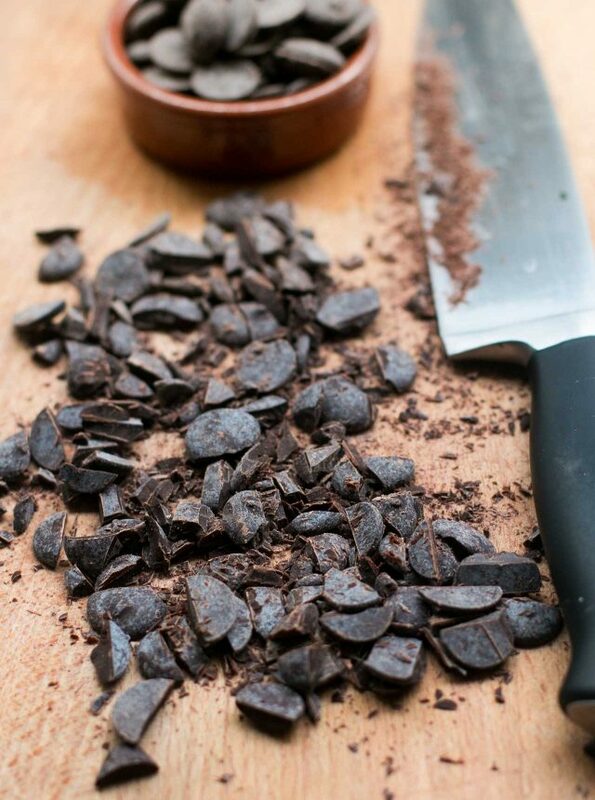 Where do you find your chocolate for baking/couverture in Paris? I used Barry-Callebaut Force Noir for these cookies. It’s a good-quality mid-range chocolate that I use for testing recipes. I buy it at G. Detou. I just had to try them the second I’d read the recipe, so I didn’t have time to bake all them at once. I left the rest of the dough at room temperature for four or five hours and then baked the rest. The dough was very stiff (unscoopable) by then, and I had to roll them into balls instead and then flatten them. But they all turned out fine. I got about 60 cookies. And as I have no chance of eating that many cookies on my own, my neighbors are now very happy, too! Your newsletter recommends the King Arthur ingredient weight chart, with 1 cup=120 grams, but this recipe calls for 1/2 cup=70 grams. Why do you use 140 grams/cup, which is at the very high end of what i see in other recipes? This reminds me of Ina’s PB Globs, my absolute fave cookie recipe. Excited to try it out! I used wholemeal barley flour (I always do instead of wheat). Very very nice. Thanks, David! If you do these with almond meal, they’d be perfect for Passover! Cake meal might substitute too. These were so good and the batter was perfect. Made a great ice cream sandwich! By far the best chocolate chocolate chip cookie I have ever made. And I have made many over the years. They are so amazing. I froze some for 3 weeks and they were still great. Thank you so for sharing.